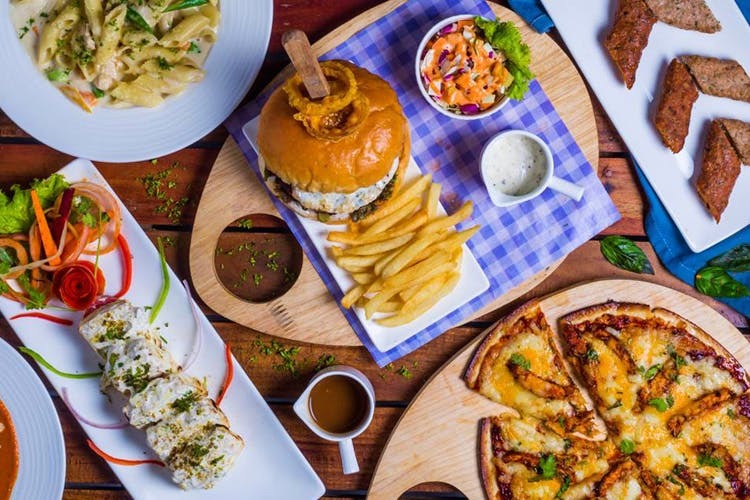 Rural Blues, the Mediterranean-themed resto-bar has had a makeover with a new menu that includes wood-fired pizzas and an open-air rooftop space. Plus, Sunday brunches with live music too! Decked out in blue and white, like a slice of Greece, the rooftop space and the other outdoor space near the wood-fired oven is our favourite spot. The menu isn't all Greek in case you are wondering. Start off with the Healthy Quinoa Salad with a lovely curry and curd dressing. Fans of the hummus, don't miss out on the Trio Hummus with the beetroot and chilli basil hummus a notch above the classic. Wash it all down with a glass of Geist craft or a signature cocktails. We had the Torturous Affection, a spiced-guava and beer drink.We didn't venture into the mains mainly because we were stuffed with the small plates that we ordered - Mushroom Dumplings and Black Beer Chicken. Shout out to the crispy Pan Masala Sauteed Papda Fish and the oval-shaped Lahmajoun Pizza which comes with minced lamb! It's a flatbread so goes well with your beer and conversation. The signature cocktails and Red Velvet pastry need some work. We also found the food a bit too spicy -- dumplings don't need that much heat! If you're looking for a romantic date, they have a special corner just for you couples, where you can customise everything for the evening. There is even a violinist to help set the mood. Read more about that here.